For about a year I’ve been trying my hand at a bit of propagation. As it stands, I’ve got a 50/50 chance of success. In the spring I tried propagating a lilac bush with clippings. Unfortunately, this failed! Sorry Suzanne — we’ll have to try something else. Last summer I propagated tons of tomato plants from suckers. This was easy and seemingly foolproof — only because I actually got it to work. 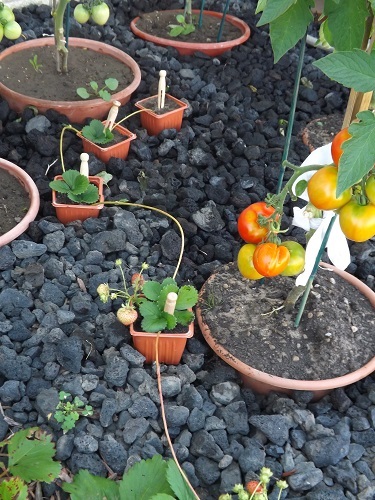 So with my track record currently even, I decided to see once and for all if I’ve got what it takes to propagate, this time with strawberries. 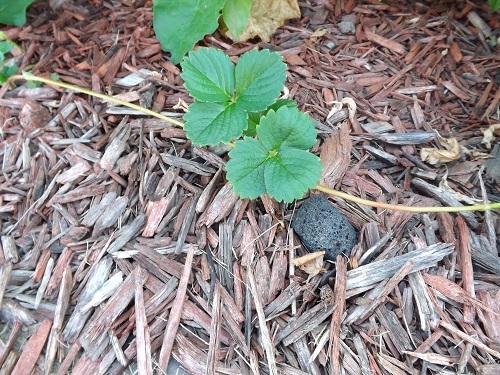 The strawberry plants I planted last spring began spreading after their first round of berries early this summer. 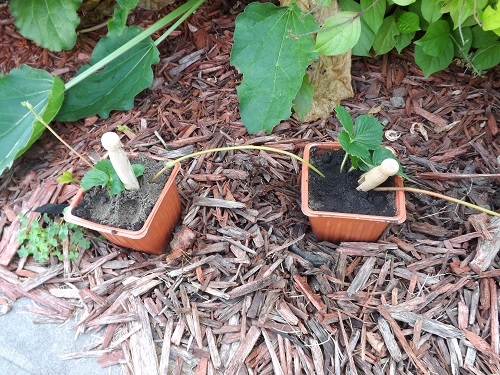 Although there are other methods to propagate strawberries (splitting plants or by seed), I decided to use the runners. 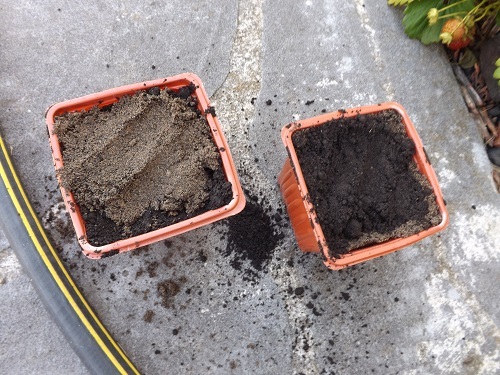 First I filled some small pots with a mixture of top soil and compost/manure. Then I carefully set the pot in the rocks or mulch and took hold of a portion of the runner where there was a node. Finally, with a clothes pin I pushed the node beneath the surface of the dirt and covered as much of the node as possible without covering the leaves. Now I’ll just wait and see if roots form and then I can cut them from their host plant and plant them someplace else. I love trying to make more plants from the ones I currently have, it sure beats having to buy new plants all the time. It might not always work out, but that doesn’t mean I’m going to give up. 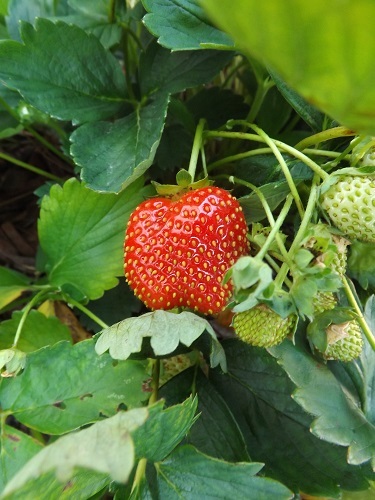 Our strawberries are still thriving and the second batch of berries are just beginning to come in, and for this I am — Simply Grateful. 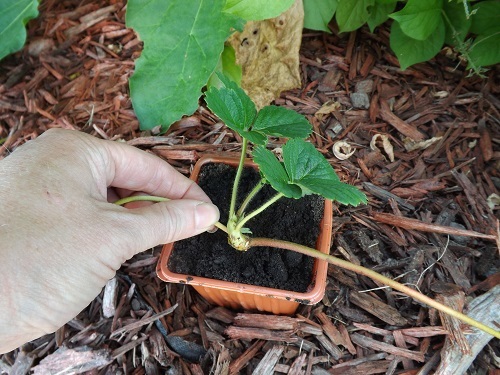 I think you will quadruple the number of strawberry plants you have this year! How funny! 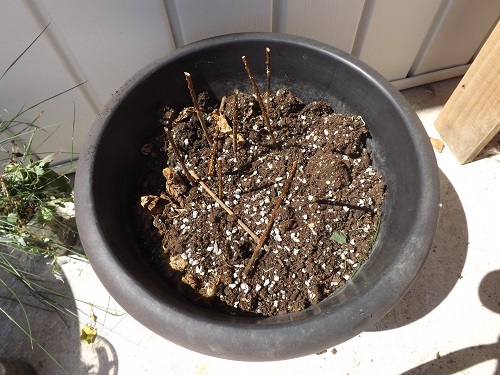 When I arrived home this afternoon, from the parked car, I was looking at the hole in my yard where a bush should be and I wondered how the lilac bush experiment was coming along. Great minds, eh?!? I’m sorry it didn’t work out but thank you so much for taking the time to try for me. 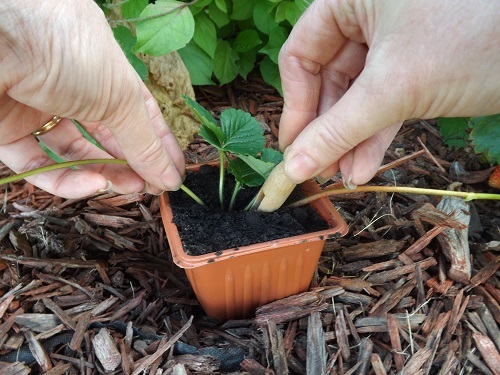 I’m keeping my fingers crossed for your strawberries. However, you have to answer a question for me. In picture number 6, if both hands are in the picture, what hands are taking the picture?!? Ahh-Haa! So that’s your secret to how you do it all, four hands! Where can I get an extra pair?